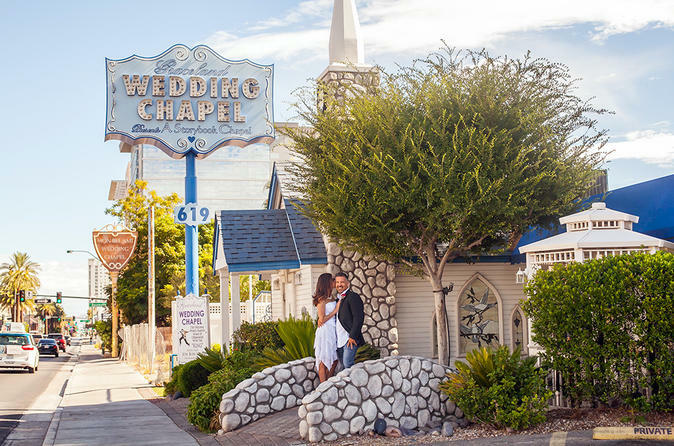 Las Vegas' Graceland Wedding Chapel is a landmark that's lasted longer than the Sands, where Sinatra and the Rat Pack made their magic, and the original Aladdin, where Elvis and Priscilla exchanged their wedding vows in 1967. For a simple wedding chapel to stand in the same spot for over 50 years is nothing short of amazing. Famous celebrity appearances that have taken place at the chapel include, Elvis Presley, Jay Leno, Johnny Depp, Hamish and Andy and more. All arrangements will be made for your special day, including fresh flowers or lifelike silk arrangements, limousine service, on-site photography, marriage certificate holder and optional DVD video production of your wedding. Religious and civil ceremonies are available. When making your reservation, please specify which ceremony you prefer. Please note: your marriage license (USD60), Ministers fee (USD60) and drivers gratuity (USD40) is not included. This package covers the ceremony only.